At 15 seconds, it becomes a mushroom cloud. The pair of suntanned strangers came to Walter Kauzmann with a mysterious offer in January 1944. Leave your defense lab here in smoky, chilly Pittsburgh, they said -- and come work on another project somewhere in New Mexico. The project was top secret, of course, this being the middle of World War II, but the 28-year-old Kauzmann was made to understand it was important. Very important. "It could win the war," said his boss, chemist George Kistiakowsky, urging him to go. Something clicked in Kauzmann's mind, a memory of a physics discovery that occurred when he was a graduate student at Princeton. And instantly, he knew what the war-winning project was: an atomic bomb. "It was a very weighty, very dreadful thing," said Kauzmann, now 82 and living in Princeton. "People still come up to me today and ask me: How could you work on such a thing?" "But I do not have regrets. If that bomb had not been used, it would have become a secret and no one would have any idea about its terrible effects. And then we might have had World War III." The building of the atomic bomb -- the Manhattan Project, as it was code-named -- was in many ways a Princeton story. At least two dozen Princetonians were among core group of brains at Los Alamos, N.M., who built the mightiest weapon ever devised. And for years afterward, the same Princetonians who built the bomb debated whether they ever should have unleashed the atom's terrifying power. Before the war, Princeton was perhaps the world's greatest clearinghouse for information on nuclear physics. In the physics department, there was Eugene Wigner, a pioneer in quantum theory; in math, John von Neumann, who used his photographic memory and nimble mind to solve baffling physics problems; in chemistry, Hugh Stott Taylor, the first man to create pure, radioactive heavy water. And then there was the Institute for Advanced Study, separate from the university, whose leading scholar was none other than Albert Einstein. Visiting physicists were drawn to Einstein like a magnet -- to discuss theories with him, debate him or simply absorb some of his genius. It was on one such trip to meet Einstein, on Jan. 16, 1939, that Niels Bohr, the great Danish physicist, brought with him the news of a discovery made by two Austrians. They had bombarded a uranium atom with neutrons and come away with a lighter element -- barium. How to explain it? Bohr offered a sensational hypothesis: The nucleus had been split. John Archibald Wheeler, then a 27-year-old, untenured Princeton professor of physics, was the first to get the news. For the next six months he would work feverishly with Bohr, scribbling on the blackboards of Fine Hall to develop the first detailed theory of atomic fission. "As Bohr became more animated, the chalk in his hand was likely to break as he stabbed the board," Wheeler wrote in his memoirs last year. "When we finished a session or broke for tea, Bohr would lift the edge of the rug in his office and kick broken bits of chalk under it. He had learned that otherwise he would be scolded by the janitor." For Wheeler, the quest for fission was a riddle of the mind -- and he never gave a thought to its practical implications. But Princeton's other physicists, many of them Jewish emigrants from Europe, had reason to be worried about what atomic energy could do. All through 1939, Adolf Hitler had been screeching anti-Jewish hate and carrying out aggression. On Sept. 1, he invaded Poland and began World War II. What if Germany, with all its industrial and scientific might, developed an atomic weapon? Princeton's emigre community shuddered at the thought. And so, in the summer of '39, professor Eugene Wigner and visiting scholar Leo Szilard approached Einstein with a request. They drafted a letter, addressed to President Franklin D. Roosevelt and advising that "the element uranium may be turned into a new and important source of energy in the immediate future." Then they asked Einstein to sign. Einstein -- despite his equation E = MC squared that provided the theoretical basis for turning atomic mass into energy -- had little interest in fission. But he grasped the nature of the Nazi menace. He ended up signing the letter to FDR, and later claimed it among his greatest regrets. When Pearl Harbor brought America into World War II, scientists had a new purpose -- to help defeat Japan and Germany. 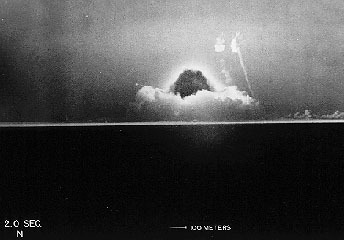 Using an atomic weapon seemed the swiftest, most effective way of doing so. But A-bombs would only work through a chain reaction -- many atoms splitting, one after the other. Einstein said it was impossible. Wigner thought otherwise. Teaming up with Nobel-winning physicist Enrico Fermi, he went to the University of Chicago in 1942 to conduct the first experiment of the Manhattan Project. Blocks of graphite were stacked together and bombarded with neutrons from uranium oxide. The chain reaction that resulted was successful, and safe. An atomic bomb now seemed within reach. The stumbling block was where to find fissionable materials with which to make it. Regular uranium would not do; only a rare isotope, U-238, could sustain a chain reaction. Taylor, in Princeton, helped perfect a method of separating U-238 by gaseous diffusion. By 1944, it was being produced on an industrial scale. In Hanford, Wash., Wheeler headed a team of physicists overseeing an unprecedent effort -- to make a new element from scratch. They would create plutonium, which had more promise than U-238 as a bomb material. The first usable quantities of plutonium began coming out of reactors in 1945. A few months earlier, Wheeler's younger brother, Joe, had been killed in Italy. "Every time I visit Joe's grave," Wheeler later remembered, "I am reminded that he is one of many -- one of many millions, I calculate, both soldiers and civilians -- whose lives might have been spared if the Allies had developed the atomic bomb a year sooner." Back in Princeton, the chairman of the physics department, Henry DeWolf Smyth, worked on U-238 separation. then wrote the War Department's official history of the atomic bomb project. Smyth always advocated open information on atomic energy and joked about the strict rules when it came to different aspects of building the bomb. "People on one project weren't allowed to speak to people on the other," Smyth said dryly. "I was in the position of not being allowed to talk to myself." At the bomb assembly grounds in Los Alamos, however, secrecy was no joking matter. It was in Los Alamos where the fissionable materials were gathered to assemble the new weapon. And it was there that leading physicists flocked, including half the Princeton physics department. When Kauzmann came to the desert in 1944, he was told he could not travel anywhere outside a perimeter of a few hundred square miles, lest he spill any secrets through small talk. All his mail was opened and read by censors. Many of the scientists resented the restrictions on their freedom, Kauzmann recalled. But most were excited to be part of history in the making. The scientists' leader, J. Robert Oppenheimer -- who was to head Princeton's Institute for Advanced Study after the war -- kept everyone loose by encouraging parties and horseplay. "We were a very young, hard-working crowd, and we knew if we didn't succeed, many lives might be lost," recalled George T. Reynolds, another Princetonian who worked on the bomb. Reynolds had arrived in 1944. As a graduate physics student in Princeton in 1940, he'd written his Ph.D dissertation on the effect of explosives, setting off TNT blasts in the woods behind Palmer Stadium. 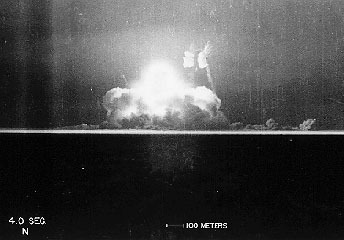 Reynolds' work demonstrated that a bomb going off in midair did far more blast damage than one that detonated upon hitting the ground. "That was how we decided that the atomic bomb should be detonated 1,000 feet above the ground," said Reynolds, now 81 and a professor emeritus at Princeton. "Part of our task was to estimate the force of the blast. We could make a pretty good guess -- we guessed it would be more than 10,000 tons of TNT -- but nothing like this had ever been done before. 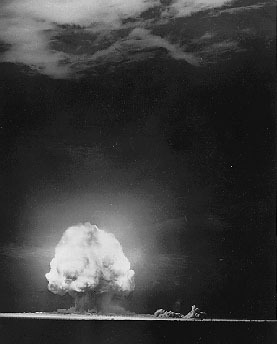 It later turned out to be about 20,000 tons of TNT." 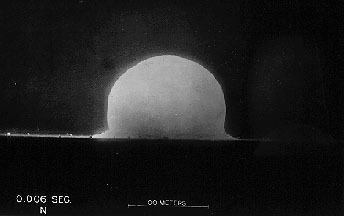 One type of bomb being made at Los Alamos had a relatively simple design using uranium. It was called "Little Boy." 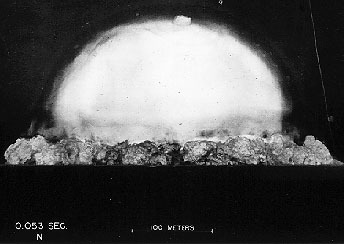 On Aug. 6, 1945, it incinerated Hiroshima. Kauzmann and other exposives experts were assigned to the more complicated bomb. With its bulbous shape, it would be called "Fat Man" and would serve as Nagasaki's executioner, a few days after Hiroshima. Back in 1944, however, Kauzmann and his colleagues did not know whether their project would work. They were to build a set of explosive charges that would surround a core of plutonium no larger than an orange. 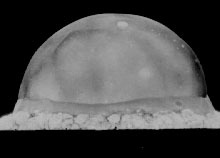 Once the charges created a shock wave -- a wave that had to be perfectly spherical -- the plutonium would collapse on itself, condensing into a critical mass and setting off a nuclear explosion. 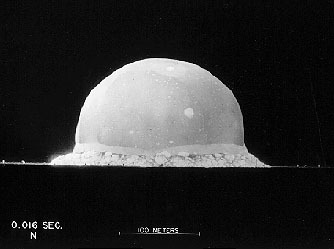 It was this model of bomb that was tested on July 16, 1945, in a remote, scrubby wasteland code-named "Trinity Site." Kauzmann was not among the elite group of scientists invited to watch. So he and a friend commandeered a '37 Chevy and drove 25 miles to a rocky mesa they considered safe. They camped out overnight and waited for the detonation, which they expected at 5 the next morning. "So we walked back to our car. And it was very rocky, so we had our eyes down, watching our footing, and suddenly there's this intense brightness. Brighter than a thousand suns. "We looked toward Trinity Site and there's a terrific flash. Our mouths opened. It took a good two minutes for the roar to reach us, and when it did, it was a crash that hit the mountains and rolled back and echoed. My friend fell to the ground from the shock wave. "The ball it formed was enormous, a mile high. It was yellow, red, purple, perfectly clear and dazzling. "What did I say? I just said, 'It worked.' "